For whatever the reason, Lord of the Rings papercraft is a rare thing. 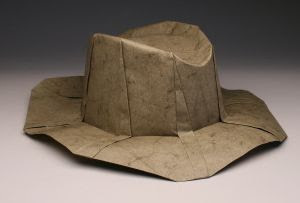 This Shelob paper model is one of the few examples around. 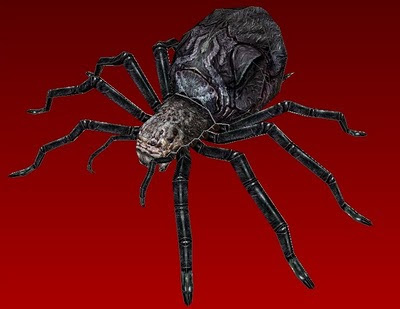 Shelob is described by author J. R. R. Tolkien as being an "evil thing in spider form" whose food was "all living things". In the books, Shelob first appears in the second book in the Lord of the Rings trilogy, The Two Towers, however in the movie trilogy her appearance is delayed until the The Return of the King, the third book in the series. This papercraft was created by "Kangu" and the Pepakura PDO template is available here. When building this model it should be noted that the gluing tabs for the legs may need to be trimmed down some in order to get the legs to fit together properly. 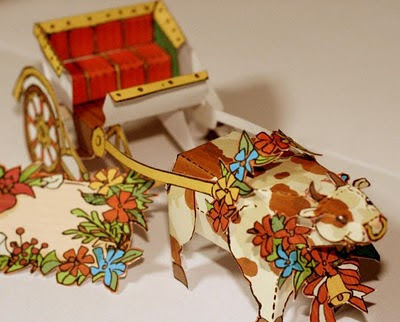 This papercraft cow buggy may represent some real festival or it may just be a fanciful creation by the artist, but either way it sure is cute. ^^ Japanese artist Geco Hirasawa calls her work a "moo moo buggy". A template is available on Geco's DeviantART page here. Be sure to check out her collection of excellent paintings while you are there. 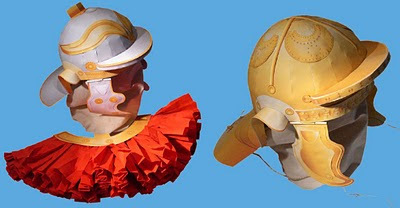 These 1:1 scale papercraft Roman military helmets were created by Hans-Dieter Richter of Berlin, Germany. On the left is a centurion's helmet and on the right is a legionary's helmet. Centurions typically commanded anywhere from 80 to 100 legionaries in the Roman military system. The templates for these helmets may be found here and here. Just when I think I can't find another use for one of my papercraft templates, along comes another idea! 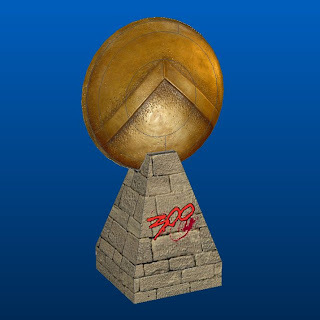 Such was the case with this Spartan shield from the movie 300. This shield is based on the same template I used for my Tron identity disk models and also my Captain America shield model. I won't repeat the template size info again because it is the same as the previous shields. A download of the template is available here. The Toyota 2000GT was produced in very limited quantities from the late 60's to the early 70's, but it quickly put Toyota on the map as a serious competitor in the realm of sports car design. 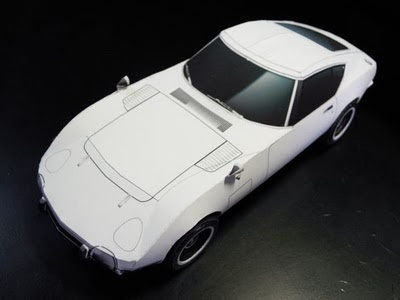 This finely detailed papercraft model of the 2000GT was designed by Shinya of Japan. Downloads of the template are available at Shinya's webpage here, just click on the yellow buttons near the bottom of the page. In 1974, American motorcycle daredevil Evel Knievel attempted to jump the Snake River Canyon in southern Idaho in a vehicle known as the "Skycycle X-2". While the vehicle did have two wheels, it was really more rocket than motorcycle. 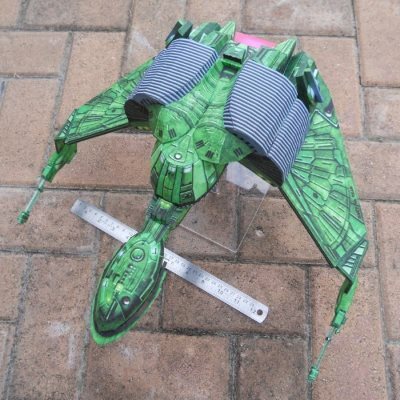 This papercraft version of the X-2 is the work of model rocket enthusiast, Wayne Hill. The model is intended to be used in model rocketry, but I think it would make an interesting bookshelf model as well. The two part template download is near the middle of the page here. 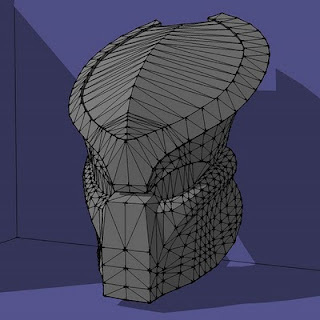 Some guys at the 405th Infantry Division costuming forum have put together a template for a full size papercraft model of the helmets that appear in the Predator movies. These helmets are worn by the extraterrestrial predators themselves and in the movies are only occasionally removed to reveal the grotesque faces that lie beneath. The Pepakura PDO file of the template was posted by 405th forum member Spartan857 while the original 3D model was created by member Droodles. Go here for a download of the template. Considered by many to be the French counterpart of the German Volkswagen Beetle, the Citroen 2CV had a production run from 1948 till 1990. On the left is the standard 2CV and on the right is the "camoinette" or small truck version. Both of these apparently hand drawn paper models are the creation of Swiss art professor Christof Schelbert. To download the templates click on the photos here. 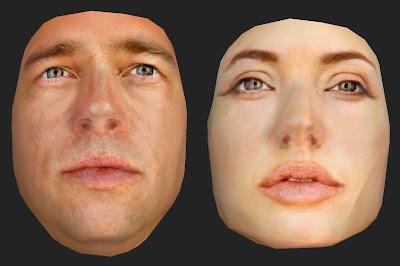 These photo-realistic 3D paper masks of Brad Pitt and Angelina Jolie are at the same time creepy and fascinating. The thought of people actually wearing these masks makes me a little uncomfortable. It reminds me of that scene in The Silence of the Lambs when Hannibal Lecter wears the skin of a guard's face in order to escape prison. :P These masks are two of eight free 3D mask samples offered by ThatsMyFace.com, a website which sells gifts with personalized faces. Other masks offered include Bruce Willis, David Letterman, and Daniel Craig. Download the mask templates by clicking on the photos near the bottom of the page here. Ah, taco trucks... those stereotypical catering trucks where the side opens up to reveal a food counter where anything from hot dogs to tacos might be sold. Goopymart has created eight different cartoonish papercraft models of taco trucks. 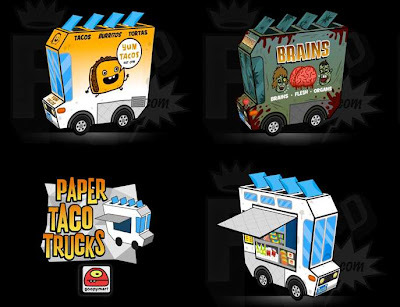 My personal favorite is the zombie taco truck which sells brains, flesh and organs instead of regular food. Templates of all eight trucks are located here.